Radio, the "Terrific Weapon of Mass Appeal"
Europe is afraid of radio. The military mind is always afraid of anything new, and in Europe the brass hats are far more influential, perhaps necessarily so, than in the civilian Continent of North America. Beneath all the vaudeville and the jazz, radio is a terrific weapon of mass appeal. The British Government keeps that weapon handy to its grasp, but normally abstains from using it. There is a fear, however, that a day may come when circumstances will not be normal, when the children's hour and the cricket scores will suddenly cease, and the British Government will resort to much the same use of radio as Hitler, Stalin and Mussolini have been making for years past. Just now the government has granted the British Broadcasting Corporation a ten-year extension of its charter. The BBC remains a monopoly covering the whole of Great Britain and Northern Ireland. The ban on sponsored programs continues and the license fee of 10 shillings a year ($2.50), which is now paid by about 7,000,000 set owners, goes on. The contrast between American and British radio is marked. The BBC has twenty-one transmitting stations and a home audience of perhaps 30,000,000 listeners crowded into an island area no bigger than Oregon. American radio has more than 600 stations and perhaps 90,000,000 listeners on its vast continent—more stations and more listeners than the whole of Europe contains. In Britain it is easy enough to snap off the programs of the BBC and turn to some station on the Continent; and if it is music you want, the fact that the announcer talks in some Continental language is of no great consequence. In fact, you can get sponsored music with English announcers from one or two Continental stations. Despite the BBC's ban on them, Britain advertisers romp into hundreds of thousands of British sets from the high-powered Luxembourg station on the Continent. You can get the news in English from some of the Continental stations, but in Europe the suspicion of propaganda attaches to any station that broadcasts in a language not its own. You can get a service in English and Irish from the Athlone station in the Free State, but aside from the lists of winners in the Irish Sweepstakes drawings the Athlone programs do not offer much to interest Britishers. Sir John Is the "Czar"
The fact remains that the BBC supplies the one English broadcasting service in the whole of Europe, and that service is a monopoly service. 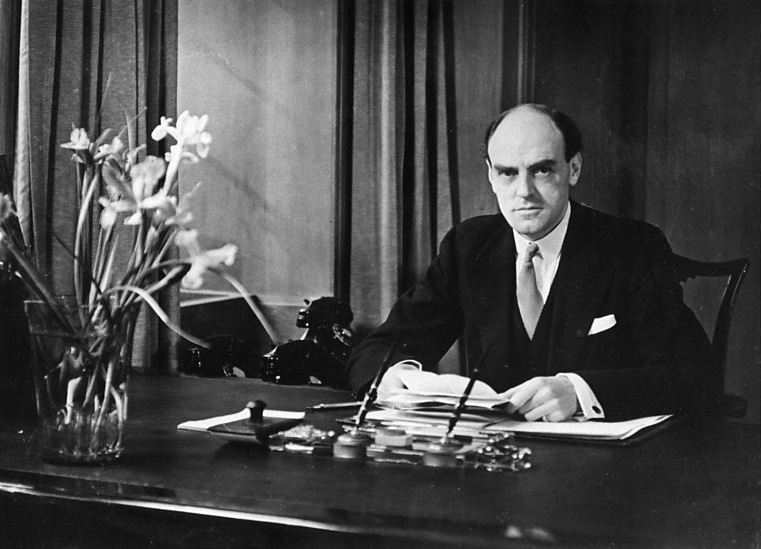 The responsibility for all the programs that are broadcast from all the stations in Great Britain and Northern Ireland traces ultimately to one man, Sir John Reith, director general of the BBC. Sir John is a dictator for two reasons—because his job is a dictator's job and because he, himself, is cold, aloof and dictatorial by temperament. Suppose that printing were the subject of a similar monopoly. Suppose that a chartered company had complete and final authority throughout the whole of Great Britain and Northern Ireland to determine what books, magazines and newspapers could be printed for public circulation. Suppose that the one company not only chose the material but also printed and circulated it, and nobody else was allowed to print any kind of matter intended for the public. Such a dictatorship would be unthinkable in any normal country. Yet that is the system which the British have applied to radio. With variations of one kind and another it exists in many countries on the Continent. The BBC is so crashing an exception to the British rule of laissez faire that some very real and imperative reason for its existence has to be assumed. That reason is not difficult to hit upon. The BBC is not a government department. Nevertheless, its white new modernistic headquarters building in London is proof against any such raid as the Austrian Nazis made on the Vienna broadcasting station a couple of years ago. Even if it were cut off from its outside supplies of water and electricity, it could continue running. Even if it were forced to shut down, all its transmitting stations have emergency studios of their own. The key station of its entire network, the Droitwich station, is a massive structure of reinforced concrete, having its own water reservoirs, electrical generators and emergency studios, and occupying, like the smaller stations, a site chosen for its security as well as its technical advantages. On this impregnable foundation, the British have built up a broadcasting monopoly which raises entertainment and instruction to the status of one of the public utility services. The State regulates it by charter and appoints its governors. The post office collects its revenue from set-owners, has a share in its technical contract and maintains the rights of censorship over its programs. That right is said never to have been exercised, and indeed there seems to be no very obvious reason why under normal circumstances it should be. The amount of controversial matter which the BBC handles in its ordinary programs is thinned down to an irreducible minimum, and in the handling of that minimum the BBC is scrupulously impersonal and impartial. Sir John Reith has been known to seize a page of election returns from one of his announcers in the middle of a broadcast and to read the remaining returns into the microphone himself because he thought his announcer's intonation was not measuring up to the BBC's standard of complete detachment. The ordinary run of BBC news comes from the four British news agencies and is studiously colorless. Out-and-out politics, or the broadcasting of party views on controversial questions, is normally limited to the budget and to general election campaigns; and the access of each party to the air is arranged by the party leaders in the House of Commons. The BBC is careful to keep the Commons well to the fore as the center of the country's political life. The Chancellor of the Exchequer broadcasts on the evening of budget day and the leader of the Opposition has the same amount of program time allotted to him on the following evening. While the BBC is obsessed with the importance of preventing the political "abuse" of radio, the American networks have made radio a powerful instrument of political education and so far they have touched only the fringes of its possibilities. Already radio is credited with a share in raising the popular vote in Presidential elections. 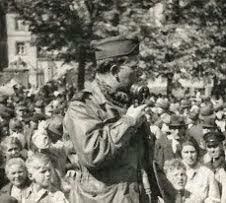 By carrying political speeches into the home it has helped to interest women in politics. But the point of present interest is that the American radio executive is free to allot his program time to politics in any way consistent with impartiality and with the "public convenience, interest and necessity."